Suitable for all material with a humidity of less than 2% and a material hardness of max. 4 (Mohs scale), suitable for virtually all sectors where very fine grinding is required: minerals, pharmaceutical, chemical, food, etc. Product particle fineness d97, 8 ÷ 120 micron. Special application for toxic waste smoke treatment. The grinding process is achieved by the impact of the material particles against the grinding track and against each other. 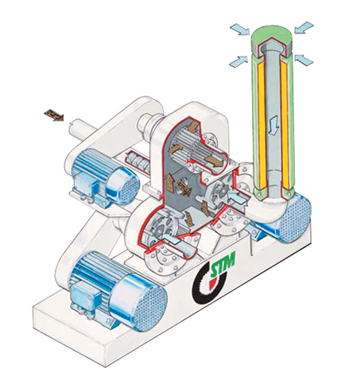 The grinding chamber is divided into two sections each with its own grinding disc. 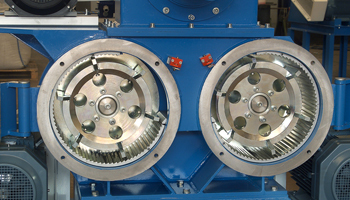 The two discs are turning in different directions against each other thus generating the particle flow against the grinding track and against each other. This grinding method results in an optimised energy efficiency. Compact design, limited space requirement, easy installation.